Another 'bridal' piece. For a petite bride with a beautiful almost backless wedding gown. The back drop is around 12" and she can wear this with the drop in the front when she wears an outfit with a plunging neckline then the centre drop falls somewhere just above her waist. Aurora Borealis finish spacers and a large drop. 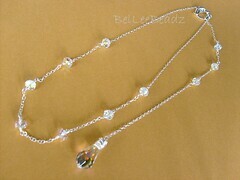 Necklace completed in 925 silver, measures approx 15". Bad photograph but quite stunning in reality.